What Do Students Learn in Grade School Math? In grade school, students start out by learning to count and identify basic shapes. By fifth grade, they'll be able to multiply and divide with multi-digit numbers, represent data using graphs and work with decimals and fractions. Keep reading for more info about grade school math skills! 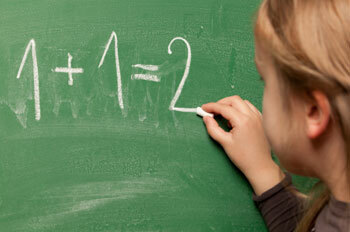 What Do Children Learn in Grade School Math? At the beginning of grade school, students learn to recognize numbers and count objects. After your child has learned to count by ones, she'll progress to counting by twos, fives and tens. Your child may also be asked to compare two quantities and identify which one is larger. Students are formally introduced to fractions in third grade, and they begin studying the place value system as early as second grade. The decimal system is generally introduced in fifth grade. 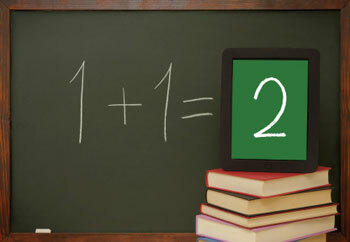 Once your grade school student has a strong grasp of numbers in general, he will learn to add and subtract. Starting out, he'll work on recognizing the addition and subtraction symbols. Then, he'll learn to add and subtract using concrete physical objects (manipulatives). For example, he might be given five blocks and asked to take away two of them to solve 5 - 2. After he's mastered this skill, your child will learn to solve basic one-digit addition and subtraction problems in his head. Next, he'll begin completing simple word problems that involve addition and subtraction. For instance, he might be asked how many students are in a class altogether if there are six girls and seven boys (6 + 7 = 13). In the upper elementary grades, your student will learn to add and subtract with multi-digit numbers. Students typically start learning about multiplication and division in third grade. They'll first be taught to recognize the multiplication and division symbols, and then they'll start completing problems with the aid of manipulatives and pictures. For example, they may be given eight beads and asked to divide them into groups of four. This is also the point where students memorize the basic multiplication and division facts. After they've mastered them, they'll move on to multiply and divide with multi-digit numbers. Long division is usually introduced in fourth grade. Your grade school student will also learn math skills used in everyday life, such as telling time, measuring objects and working with money. Second graders learn that objects can be measured in different units, such as inches and centimeters, and they also learn to create bar and picture graphs. In third grade, students extend their measurement skills to work with mass and liquid volume, and they begin studying area and perimeter as well.